The 000-17 Whiskey Sunset Auditorium model boasts a rich, warm sunburst finish that will delight any player with its aesthetic beauty. Skillfully crafted from a solid Sitka spruce top and mahogany back and sides with grained ivoroid binding, a modified low oval neck with a Performing Artist taper, and a rosewood fingerboard and bridge, this guitar produces beautiful dynamic tones that will please the most discerning musician. 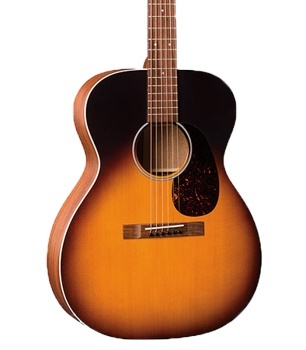 This model comes equipped with Matrix VT Enhance acoustic amplification by Fishman®.